Messier 73 (M73) is an asterism formed by four physically unrelated stars located in the southern constellation Aquarius. M73 has an apparent magnitude of 9 and lies at an approximate distance of 2,500 light years from Earth. It has the designation NGC 6994 in the New General Catalogue. The four stars that form the Y-shaped asterism only appear close to each other in the sky because they are located along the same line of sight when seen from Earth. 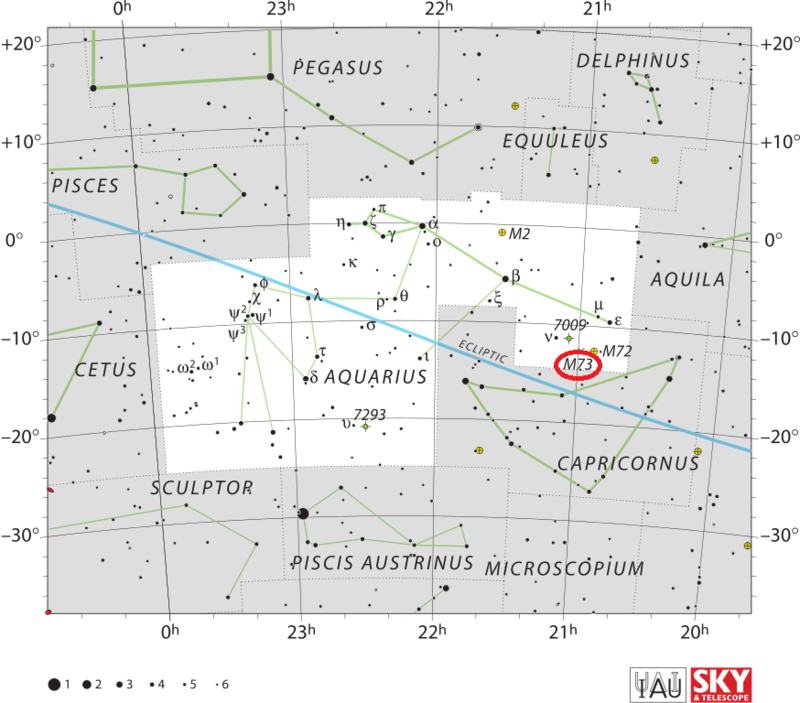 The asterism can be found in the southern part of Aquarius constellation, near the border with Capricornus. 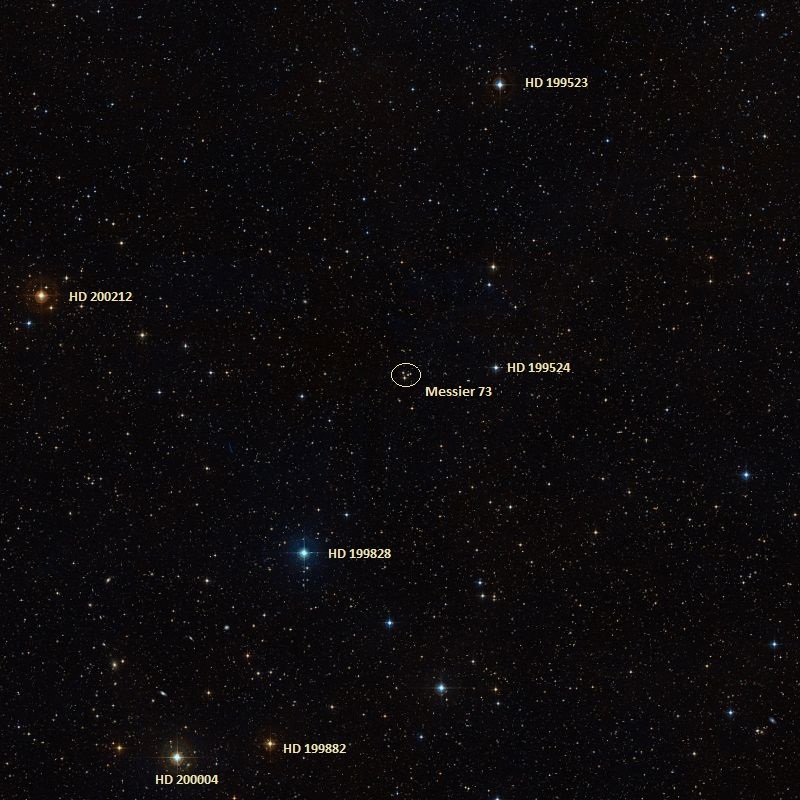 It is positioned about 1.5 degrees east of the globular cluster Messier 72, and just below the imaginary line connecting the bright stars Fomalhaut in Piscis Austrinus and Altair in Aquila constellation. M73 can also be found 2 degrees south and 1.5 degrees east of the magnitude 4.5 star Albulaan, Nu Aquarii. As both Aquarius and Capricornus are relatively faint constellations, M72 and M73 are among the more challenging Messier objects to find. The stars of M73 are quite faint and not easy to observe in 10×50 binoculars. Larger binoculars will reveal a dim point of light, while a 4-inch telescope will show the Y shape clearly. The best time of year to observe M73 is during the summer. The stars that form M73 have apparent magnitudes of 10.48, 11.32, 11.90 and 11.94, and occupy an area of 2.8 arc minutes of apparent sky. Messier 73 was previously thought to be a poorly populated open star cluster and its stars were believed to be bound by gravitational attraction. Today, it is known to be one of the three Messier objects that are not deep sky objects at all, along with the double star Messier 40 and the Milky Way star cloud Messier 24 (Sagittarius Star Cloud). 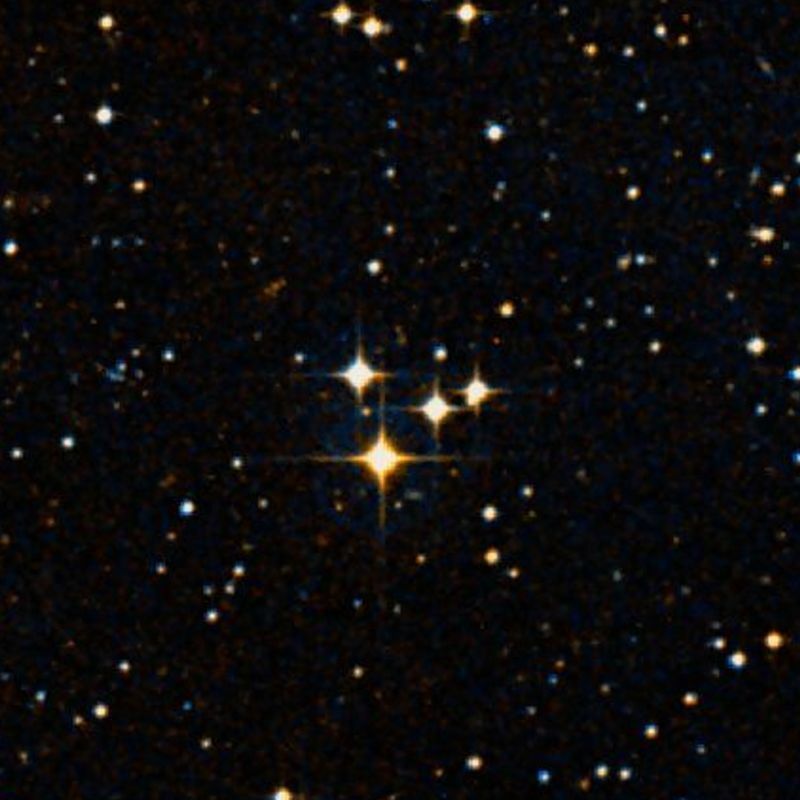 Cluster of three or four small stars, which resembles a nebula at first sight, containing a little nebulosity: this cluster is situated on the same parallel as the preceding nebula [Messier 72]: its position was determined from the same star Nu Aquarii. 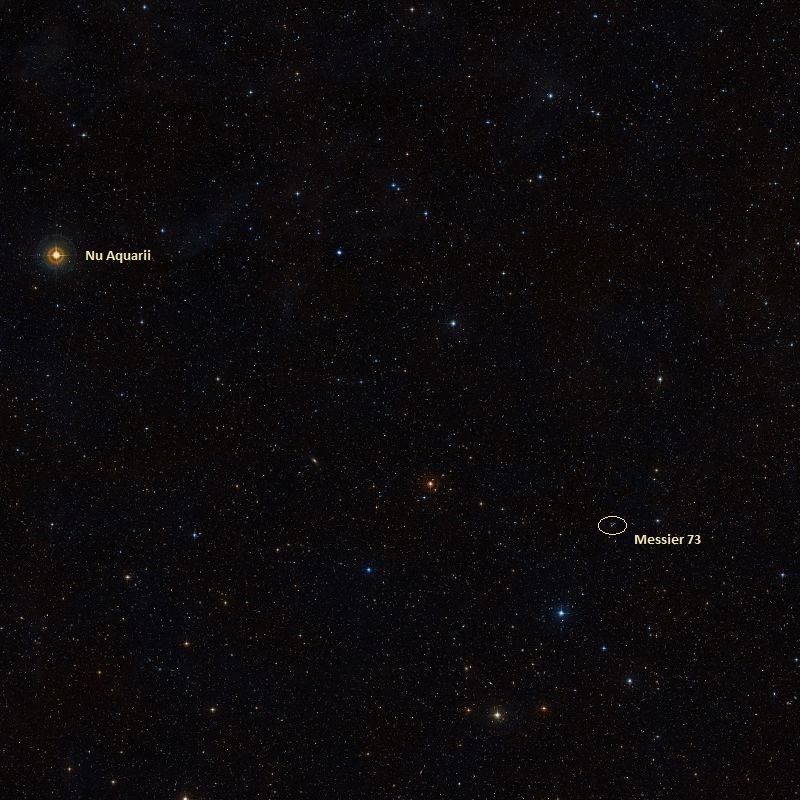 Even though there has been a lot of debate about the nature of M73 since Messier’s discovery, recent studies indicate that M73 is not an open cluster, but merely an asterism, and that the four stars lie at different distances from Earth and are moving in different directions. However, as recently as 2000, a photometry study suggested that M73 was a cluster remnant, about 9 arc minutes wide, with an estimated age of 2 to 3 billion years. It was only two years later that a high-resolution spectroscopic study of the spectra of the six brightest stars near the centre of M73 revealed that the four stars were not in fact physically related.